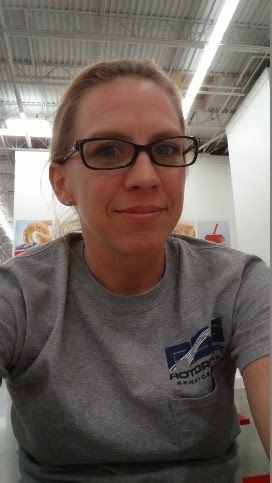 Have you met Kimberley A. Christianson, U.S. Navy veteran and recipient of the Ousley Family Veterans Service Scholarship? This Fort Worth campus student is working on her bachelor's degree in computer information systems and has an interesting background in avionics. "I first joined the U.S. Navy on Aug. 12, 1996. I spent five and a half years as an aviation electronics technician. My first duty station was AIMD, NAS Oceana, working on Electronic Counter Measures equipment. When I rotated to sea duty, I was attached to VFA 136 Knighthawks, NAS Oceana, working on F/A 18C Hornets. "I separated from the Navy March 12, 2002. I currently live in Justin, Texas, and I am pursuing a Bachelor of Science in Computer Information Systems. My educational goal is to get my degree in computer information systems emphasized with software engineering classes. I am currently an avionics technician on aircraft, both commercial and government, but I have always been interested in the how and why they function the way they do. So, my long term goal is to stay in aviation because I love it so much, but to be involved in the engineering aspect of avionics." Kimberley is an excellent example of a student who is going for greater by combining her skills, passions and education to do something she enjoys. Congratulations on being selected as an Ousley Scholarship recipient, Kimberley! The Ousley Family Veterans Service Scholarship is presented to a Columbia College student veteran of the United States military who is making satisfactory progress toward a degree. Preference is given to a student veteran who has exhausted his/her VA educational benefits. The award is for $500 that can be used toward college expenses.